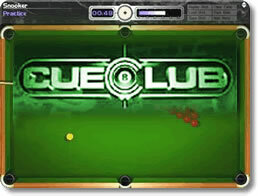 Cue Club Game Review - Download and Play Free Version! This is the Billiards Game for You! Cue Club gives you the most comprehensive and detailed pool sim available. It will actually make your real game better and for all ages and skill levels. Kids can play in the "slam" mode and just smash balls around the table with their hand and the pool connoisseur can take on one of hundreds opponents in tournament mode. Once you've gotten enough practice you can enter a tournament and rise to billiards glory against a variety of opponents. If you are a beginner don't worry! The Practice mode allows you to move any of the balls where ever you want, making practice easy. 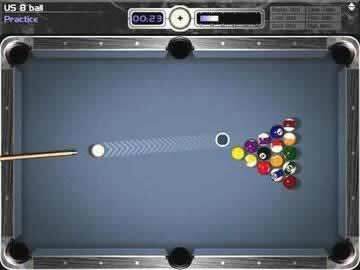 If you are a billiards master the practice mode allows you to set up complex trick shots that mesmerize your opponents. Play Billiards the Way You Want! This game is fully customizable. Everything from the rules to the color of the table's trim. You can change the game to your liking. Also customize the balls, cues, and the table felt. Cue Club is unlike other billiards games because it makes you a better player in real life. Other games show you the ball's path, which builds bad habits, but Cue Club guides you to learn how to make shots correctly with the detailed shot-taking style. Get the Most Realistic Billiards Experience You Can with Cue Club! This game puts you in the pool hall by featuring realistic graphics and sounds, real ball response, and lifelike physics to make the motion of the game real. Talk Smack to Hundreds of Opponents! Play against a friend or one of the hundreds of computer players in this realistic pool sim. The computer players play as natural as humans and can make mistakes. You can even chat with the computer players and talk smack if you want. Pocket Balls You Never Thought You Could! Make seemingly impossible shots with the detailed controls in Cue Club. Apply English and spin to the ball to easily sink the shots you used to miss. Cue Club gives you the most control over the cue, cue ball, and other balls. Sound like a winner? It is! Download Cue Club now and experience one excellent pool and billiards simulation! Cue Club is a realistic and exciting pool game that lets you test your skills against opponents in a variety of games ranging from 8-ball to snooker. Several modes let you face off against the computer, go head-to-head against a friend, or hone your skills and practice trick shots. Realistic play and physics adds the need for some strategy and planning of shots. You have control over the rules of the game and the type of shot you take. Don't hesitate to play and see just what kind of amazing trick shots you can make. While the way you play will change depending on which type of pool or snooker you're playing, there are a few common basics. 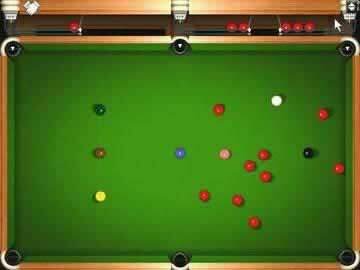 You must try to pocket balls into pockets on the pool table by hitting them with a cue ball. You hit the cue ball itself with a cue stick, and you have a good deal of control over how you hit the cue ball. You can adjust the position you hit the ball, the direction you hit the ball from, how hard you hit it, and the angle you hit it at. You've got to use the correct combination of options to hit the cue ball into the other balls and knock them into the pockets. Additionally, you'll have other options available to you like watching replays of earlier shots or applying chalk to the cue stick to give more spin to the cue ball when hit. Cue Club offers several different game types to choose from. You can play US or European 8-ball, 9-ball, snooker, mini-snooker, speed ball, and killer. Each game type brings its own unique rules that you must follow. For example, killer requires you to pocket a ball on every shot you make or you lose a life (lose three and you lose the game) while speed ball just requires you to pocket all the balls as fast as possible. Additionally, many of these games can be played against one or more opponents. You can play with anywhere from 1-7 computer controlled opponents or 1-7 friends on your computer depending on the game type. All the different games to choose from add a lot of variety and ensure that Cue Club offers something for everyone. On top of the different types of games, there are several modes choose from as well. A Quick Game will let you start a game right away against a computer opponent, while a Two-Player Game will let you face off against a friend. Virtual Chat Rooms allow you to go into chat rooms filled with computer opponents and challenge them. While having computer opponents simulate a chat room is an interesting idea, it really doesn't add anything or serve any sort of purpose. The Tournaments mode allows you to compete in a tournament for trophies. There's a Practice mode as well where you can practice shots and hone your skills. You also have the option to play the SLAM! mode, which allows you to move and slam balls together with just the mouse. Despite all the choices and options, there is no online allowing you to play against other players. The ability to play online would have been a great addition to this game. Cue Club lets you customize the difficulty level to find games and opponents that match up to your skill. Not only can you directly adjust the difficulty level of the computer opponents, but you can also change the rules of the various game types to makes mistakes less punishing or add in tougher requirements. The game does a good job of providing enough options for players to find something that's right for them. The game also does a decent job of providing enough information and explanation for new players (or players unfamiliar with pool/snooker altogether). There is a Player's Guide that outlines the basics of how to play the game, how to do some trick shots using these controls, the different game rules, and hints for each game type. It's mainly text and takes a while to get through, but it comes in handy when you don't know or forget how to do trick shots or the rules of a game. Cue Club has a solid presentation as well. The graphics are good for a game of this type, and don't really detract from the play in any way. The sound effects are realistic and spot on. The only real problem with this aspect of the game is that absence of any music for the downloaded version of the game. Not having the music keeps the download small, but music would be a nice replacement for much of the silence through the game. The huge variety of game modes and different options helps keep this game fresh and interesting. In the mood for some traditional pool action? 8-ball is your game. Feel like something quick? Speed ball will let you get your pool fix in no time. Just want to mess around? SLAM! or Practice mode will let you do whatever you want. There's a lot to keep you playing and coming back again and again. Overall, Cue Club is an excellent game with only a few flaws that have more to do with what the game could use than what is wrong with it. This game is a perfect choice for anyone interested in pool games or looking for a fun, realistic pool experience. You have several modes and game types that add a ton of options to what you can play and how you play it. There''s strategy involved in correctly lining up shots and what kind of shots you take. You have a great deal of control over how you can shoot. You can save and watch replays of shots by you or others. There's no reason not to give Cue Club a try today. Player created video showing some of the cool trick shots you can do in the game.